Dogs are known to be man’s best friend. The great outdoors happens to be one of man’s favorite leisurely pastimes. Imagine a vacation, a weekend trip, or an afternoon spent hiking, fishing, and enjoying the starry night sky with your favorite four legged canine companion. Well, now you and your pal can—in style too. This dream is made possible by the collaboration between Carolina Pet Company and Pendleton Woolen Mills. The partnership marries the classic and iconic Pendleton brand with the manufacturing and distribution expertise of Carolina Pet. The result…a line of pet beds, collars, leashes, jackets and portable / collapsible food and water totes that will be introduced in July as the Pendleton Pet Collection. The initial introduction will incorporate the colors and patterns of Pendleton’s ever-popular National Park Collection and pay homage to the 100th anniversary of the National Park Service. 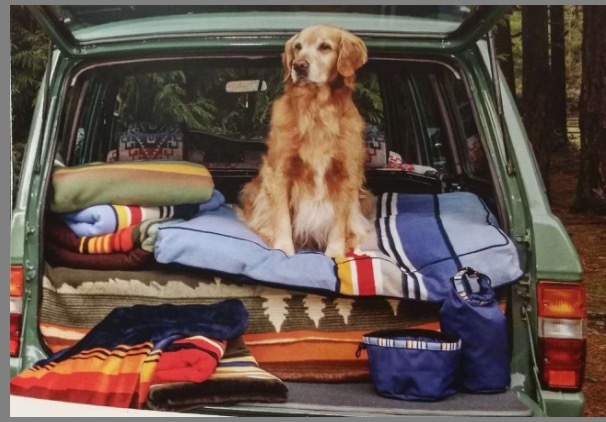 Carolina Pet Company and Pendleton Woolen Mills are also patterning a line of pet products with the colors and patterns of Pendleton’s The Yakima Camp brand. It only makes sense as The Yakima Camp Collection is Pendleton’s most popular blanket pattern! What does this mean for pets and pet owners? An exciting new look and a chance for customers to enjoy the best of both companies—Carolina Pet’s build quality and Pendleton Woolen Mills’ iconic brand. Carolina Pet Company, LLC, is a company well versed in making comfortable and accommodating pet products that are easy to care for. Pendleton is one of America’s most timeless (150 years old) and valued brands. Each company understands the quality their customers expect and the comfort man’s best friend deserves. Like the natural beauty that stems from nature, their joint venture has created something truly beautiful—take a look at the luscious, cool, practical colors and patterns of the National Park Collection or the tradition mineral and green colors and patterns of the Yakima Camp Collection. The good thing is you and your furry friend won’t be waiting long as the line is set to launch this summer. The only question remains is do you want to go on a trip? Pick your park and its inspired pet gear— pack up as the dog calls shotgun!